This is Ben, an infant treated at The Cystic Fibrosis Center at St. Joseph’s Children’s Hospital. 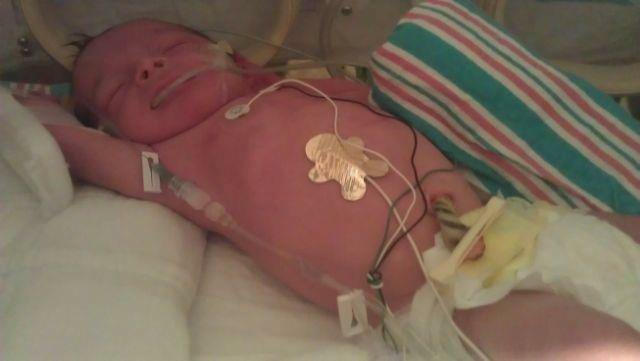 Ben was born with meconium ilieus — his 1st stool (meconium) was blocking the last part of his small intestine (ileum). Almost all babies with meconium ileus have cystic fibrosis. Ben’s serious situation required an immediate surgery called an intestinal resection. On August 21, Ben will be 8 months old. Already, he has spent more than half of his life (over 4 months!) at St. Joseph’s. Even with insurance, Ben’s parents have accumulated medical expenses that would blow your mind away.